You may want to create a large dummy sample files on Windows PC for specific requirement. Dummy files of fixed size can be used to test data transfer over network. You can use huge sample files to over-write sensitive data on the hard drive. These can also be used to fill up USB pen drives and prevent malicious content to transfer or execute. On Windows PC, you can use Fsutil command method or third party utility programs to create large dummy files of specific sizes. You can easily create dummy file of specific size which do not contain any data using Fsutil command. 1. 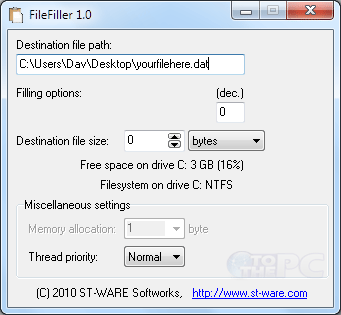 Download FileFiller program [Official website not available now – st-ware.com/page.php?21 – you can download it from cnet website] on your Windows (7, Vista, XP, 2000, NT) computer. It is a free utility program of small size (178 kB). 2. Select the dummy file destination path / folder. Also select name for the dummy file being created using this program. Then click to select filling data type for the dummy file among options like NULL(empty), ASCII ordinary value or random data. 3. Enter the size value for the dummy file. It supports upto 4GB for FAT formatted partition and upto 80GB for NTFS partition. Then click GO button to create dummy sample file at specified location on your Windows PC. Fsutil command creates an empty file..not a real file.. Check the below link..it has some simple commands to create files with real data.